The center MFD for radar and moving map display. EGI nav similar to A-10C and AV-8B/NA. 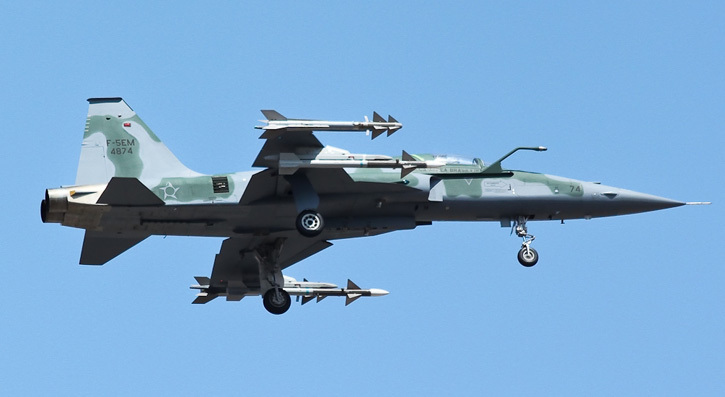 The N like Brazil's EM variant can probably carry AIM-9M. I dunno if either can carry AIM-120A/B. Probably not. Perhaps expanded ability to carry more then 2 X AIM-9P5 on outer wing pylons, in addition to wing tips. Would be nice to have more then a handfull of chaff/flare that F-5E has. Raytheon did develop and market ECM for F-5 family. Isn't Garmin NS430 a civil aviation product? Yes. It´s the kind of equipment you can find in a Cessna 172. But sometimes civilian GPS equipment is mounted in old military jets as a cheap field modification or something, so it´s not totally unrealistic. Last edited by Kongamato; 04-21-2019 at 06:25 PM. If we're hypothetically going the EM route, it's good to note that these variants can carry Python, Derby, and Sidewinder missiles. All extremely capable missiles, and the Derby is a BVR-capable active radar missile based off of the Python. Which it can carry on all pylons. Yeah, but I'm not really convinced the NS430 is going to see integration in future airframes. Which is a shame, really. Last edited by Auditor; 04-21-2019 at 06:29 PM. I would kill for a Brazilian EM, with refuelling probe, Python, Derby... One can dream, isn't it? Yeah, one can dream. I would like that version too. But it would be a total overhaul and revamp of the cockpit and the systems of the aircraft, new weapons that doesn´t exist in DCS "universe" and probably there are no data about... I thought the the F-5N was a more obtaineble version. PS: We already have compressor stalls and flameouts, it's just that the F-5 is incredibly resistant to them in real life. Start at angels 30,000, accelerate as fast as you can then put the nose vertical and wait. You'll very often flame out both engines, which then leads to a relight scramble. You are right. After several attempts I entered the plane into a inverted flat spin at hight altitude with full afterburner and after a while both engines suffered a flame out. Flame outs are simulated. Last edited by Kongamato; 04-23-2019 at 01:03 PM. Python 4 and Derby are deadly dangerous to any Gen aircraft. Python5, AFAIK, is only in service with IDF , has basically an expanded no escape zone. Just firing missile within zone is 99% PK. It is too good fr DCS. So is AIM-9X Block II, and R-73M2. There is no evading them , if fired. Flares are no use, they all use combined IR/CCD/UV imaging. I heard of these new flares that also emit in UV band, and have very bright visible to confound CCD. But those are likely to be modeled in DCS for next decade. The supposed bagging of F-16C Blk 50 of PaKAf by InAF Mig-21Bison, was supposedly accomplished with R-73M, and radar that was kissed(upgraded) by ELBIT with Hindustan Aero for InAF. They basically turned a 3rd Gen Mig-21 into 3.75-4 Gen fighter.